I was able to take a couple days off recently and vacation down South to defrost, but I am back in the Chicago area and guess what?? Yep, it's still cold and snowing . I enjoy soup all year long, but this time of year it is on the menu at least once a week. There's just something about a warm bowl of creamy goodness and a piece of crusty bread that really satisfies the body and helps take the chill off. 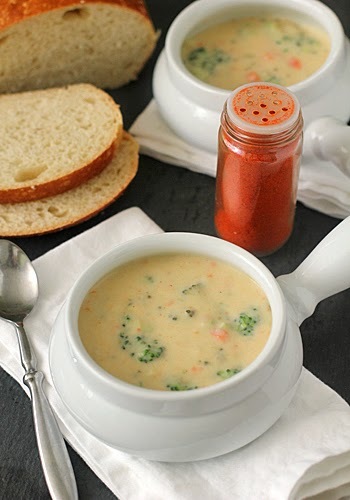 One of our favorites after a day of sledding or shoveling is Cheddar Cheese Soup. It makes for a perfect "light" lunch with some croutons for crunch. But come dinner time, I need to serve something a little more substantial. Like the cheese soup, a mixture of flour and butter is cooked with the veggies before adding the liquid. This eliminates the need for canned condensed soup. The holy trinity (onions, carrots, and celery) are simmered for a while in the soup base before adding the potatoes and broccoli ( I do this because over-cooked potatoes and broccoli are not good eats). Unlike the cheese soup, I do not purée the mixture. I leave the veggies diced for a chunky, full-bodied texture. Hit it with a dash of cayenne pepper for a kick (good for the sinuses this time of year) and grab a piece of warm bread to sop up every last bit of goodness. Well, unless you're going back for more☺. In a large stock pot, melt the butter over medium heat. Add the onion, celery, and carrots and cook until tender, but not browned, about 8-10 minutes. Add the garlic and cook until fragrant, another 1-2 minutes. Sprinkle the flour over the vegetable mixture and cook, stirring for 3-4 minutes more. Slowly whisk in the chicken stock. Whisking constantly, bring the soup to a boil. Reduce the heat to a simmer and cook until slightly thickened, about 25 minutes. Add the potato and broccoli and cook for another 20 minutes or until the vegetables are tender. Add the half-and-half, cheese, and mustard. (Do not let the mixture come to a boil.) Stir until the cheese is completely melted. Season with the Worcestershire, salt, and freshly ground black pepper to taste. Serve with cayenne pepper and crusty bread. Enjoy! Definitely a fav of mine. This looks great! Looks great. I am going to have to give this a try. Thanks for another amazing recipe. This looks so delicious! It's freezing up here in New Hampshire! Cooked this yesterday : it was amazing!! Thanks a lot for such a wonderful recipe!